In the past year, an average of 235 people who might otherwise have been homeless stayed at the Rescue Mission shelter nightly. 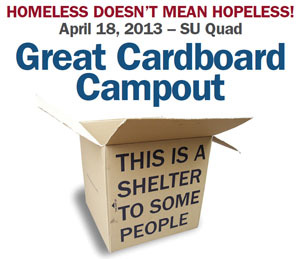 On April 18, 26 students enrolled in SPM 101, “Personal and Social Responsibility,”will sleep in cardboard boxes overnight on the SU Quad to raise awareness about homelessness. As part of these efforts, they are collecting personal care items to benefit men using the Rescue Mission shelter in the Syracuse community, including razors, soap, deodorant, toothbrushes, toothpaste, socks and underwear. “We talked about this project the very first day of classes. Students understand they have an important role to play in giving back to the communities where they live and work today and well into the future. In working with the Shaw Center for Public and Community Service, which identified the Rescue Mission as a potential partner for the class, the students are very focused on educating others about the issue of homelessness and doing something practical, like collecting supplies,” notes Falk College assistant professor of sport management Jeff Pauline, who leads the course. The coursework and related projects address personal ethical principles and social responsibility. Partially funded through a gift by SPM Advisory Board member David Kleinhandler, it is offered through the Falk College’s Department of Sport Management. Boxes have been donated by Syracuse Moving and Storage for the event, and students are only allowed to bring a sleeping bag/blanket, duct tape and a small pillow—no electronics or other comforts are permitted. Students will decorate their boxes and create educational signage for the campout area to raise visibility of the overall event. According to the Rescue Mission, the Great Cardboard Campout is similar to a charity race in that participants approach others to ask for donations. In exchange, the participating students will camp out overnight in a box. The Rescue Mission’s goal is to have 12,500 students throughout Onondaga, Cayuga and Broome counties camp out and make a commitment to do something about homelessness. For more information, contact Pauline at 315-443-9823 or jspaulin@syr.edu.